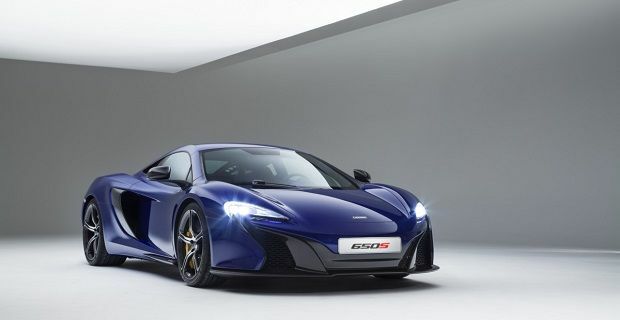 As the new McLaren 650 S is based on the McLaren 12C but with added style from the P1, you won’t be too surprised to read that it’s intended to sit between the two cars in the British super car maker’s line-up. Ahead of a public unveiling at next month’s 2014 Geneva Motor Show, where a spider and coupe will sit side-by-side, the F1 constructor’s road car division has released some official shots of their latest collection to whet the appetite. This is effectively an uprated 12C, so McLaren has used the same mid-mounted 3.8 litre twin-turbo V8 here but they’ve added an additional 25bhp to boost the power to 641bhp. Torque has also increased, going from 600Nm to 678Nm, so you get a 0-62mph time that’s a tenth of a second quicker at 3.0 seconds, and 0.5 seconds are saved from the 0-125mph sprint. In spite of all the performance improvements, McLaren say you’ll be better to the environment as the 650S has cut emissions by 4g/km to 275g/km. There’s added performance, but this is no striped-out, track-focused special. This machine is faster, more controllable and comfortable than the 12C. It’s also better looking. The front-end takes its inspiration from the McLaren P1 and it uses the same headlights as the hybrid-hypercar. The new front-end also produces 40% more downforce than the 12C when you’re going over 150mph. That’s not the only change the McLaren engineers have made. Body roll has been reduced thanks to springs that are 22% stiffer than those on the 12C, but the comfort’s not been compromised as new damper mounts have been added with the intention of making the ride as smooth as possible in a low-slung super car. McLaren has even bother to make improvements for those rare times when the car’s at low speed, so you’ll find recalibrated brakes that are less “grabby” when used at low speeds.